This looks delicious! You have butter listed twice in the slaw ingredients. Is the 2 tbsp butter supposed to be 2 tbsp sugar? I made your no knead olive bread yesterday, so good! This sounds so yummy! I love mangoes in salad. 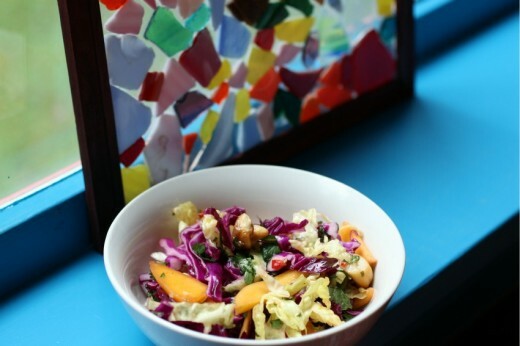 These retreats sound amazing as does the winter slaw. Wow, this looks so amazing! Something light and fresh but still wintery and comforting, well done! Maria from Two Peas forwarded me your site and I absolutely love it! Thanks for the awesome recipes. 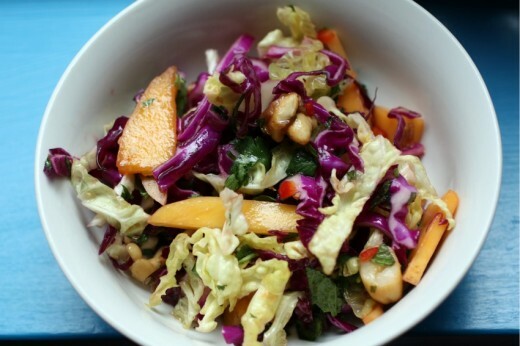 I made this salad last week too – also, skipping the papaya because I too feel that it is kind of freaky – this slaw is marvelous! I made the caramelized macadamias which I thought would be too much work – they were not! Just a lovely and delicious little detail that made the whole salad. I am sure the cashews were similarly excellent. I’m not usually a fan of restaurant coleslaw but love a good homemade one like this! Oh how I wish I could attend these retreats! The whole day just sounds completely relaxing and inspiring. This salad is on my list of things to make and it’s funny, the substitutions you made were pretty much spot on to the ones I was thinking! Glad to know they work : ) I’ll be making this soon! I do always love hearing about your yoga retreats, especially what food you’ve made for them. It sounds so inspirational…all of it. I’ve never made a slaw that I particularly liked either but, of course, leave it to Ottolenghi to provide one. I obviously need to try this. That man is a genius. 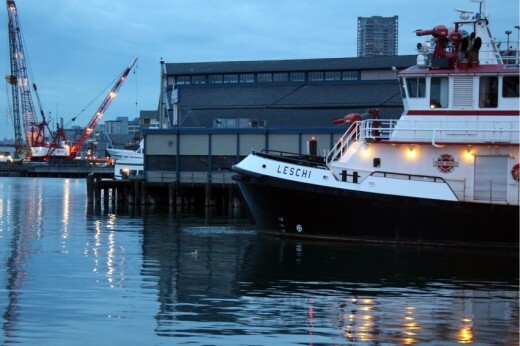 i do love your photos of dark seattle. its just like dark cape cod. 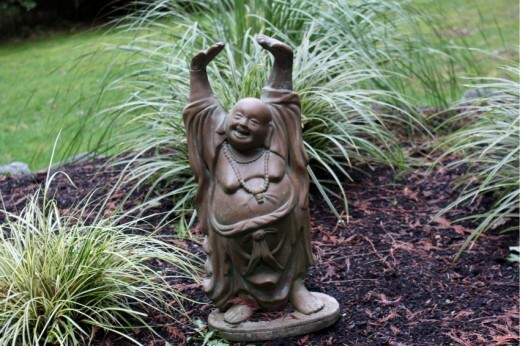 i’m sorry i did not look at the slaw, just the happy buddha & ferry. my grandparents live up on magnolia blvd in seattle. do you know that area? so damn pretty with great views. 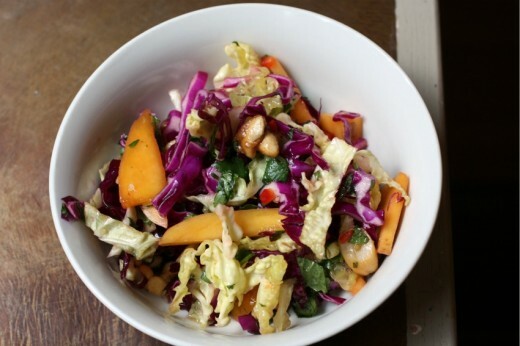 Love the crunch in this slaw! Very nice! That dressing sounds so good, I’ll have to try it soon. 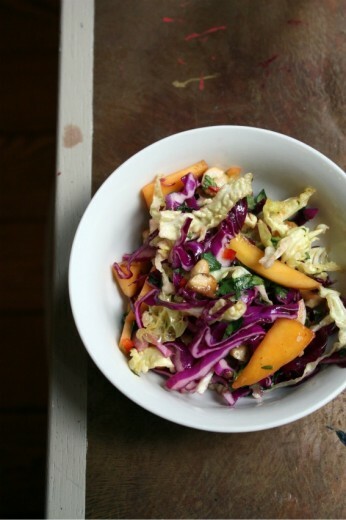 This slaw is so yummy, I have been addicted to it since I discovered it in Yotam Ottolenghi’s book, Plenty! Such a brilliant cookbook, I gave to all my foodie friends for Christmas. Sounds like you have enjoyed his book as well. So deicious! Plenty is such a wonderful cookbook. I just recently made a cabbage salad today with sauteed tempeh. This salad looks delicious too!